Joy Creek Photo Archive (c) all rights reserved We were skeptical when we first planted this variegated sea holly in our garden. After four years, Eryngium 'Jade Frost' has stood the test of time. The variegation on the leaves is clean with creamy margins surrounding blue-green centers. The foliage is fleshy and attractive throughout the season in our border. Even during the winter, the basal rosettes remain attractive. 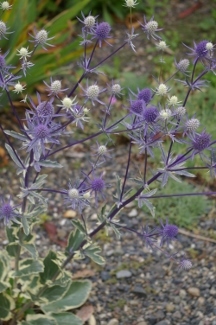 Of course, this sea holly is at its most beautiful in summer when the spiny bracts that surround the flowers turn a rich violet. That violet even stains the flowering stems. For those of you that like to make floral arrangements, the bracted flowers hold up well in a vase. June to August. 1.5-2.5 ft. x 1-1.5 ft.